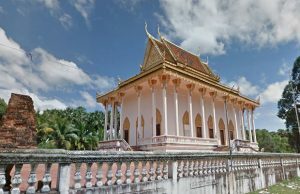 Ang Kor Chey Pagoda is located at Ban Tey Dek commune, Kean Svay District in total distance of 29 kilometers from Phnom Penh from Ta Khmao by the National Road No. 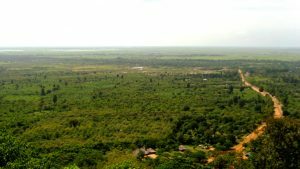 1 (Phnom Penh-Svay Rieng province). We travel along the National Road No. 1 from Phnom Penh or Ta Khmao to Kilometre 29 then exceed about 50 metres, there is a gate at the right hand side written Ang Kor Chey Pagoda. If we enter by trail about 1,600 meter, we will reach the entertainment center. The pagoda constructed with having five peaks as the temple?s peaks. Before reaching the pagoda, we need to pass over a 100-meter wooden bridge; under the bridge, there is a big pond for keeping water during the dry season. Behind Ang Kor Chey Pagoda, three is an artificial site located on the black hill characterized as resident of Neak Mean Bon or King. It is said that the black hill is a former palace because we found ancient objects and equipment like bowls and pot characterizing the ancient feature.Now, the black hill has been organized and maintained by guards because it relates to the belief in sacred objects there. 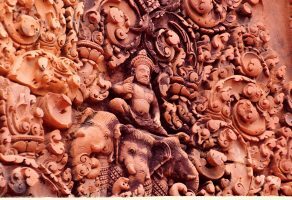 Nowadays, Angkor Chey pagoda has a lot of local visitors especially those who cling to abstract belief; they go there to have sacredly watered. 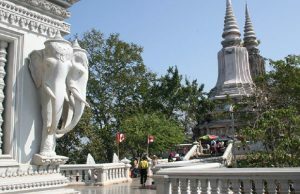 In addition, Ang Kor Chey pagoda has the beautiful scenery with cool shadow from the trees and pleasant environment.